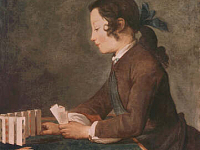 A renowned French artist of the 18th Century, Chardin was well known for his still-life works and genre paintings. His refined and realistic style had a lasting influence on some of the greatest artists of the 19th and 20th Centuries, including Henri Matisse (1869 – 1954) and Paul Cézanne (1839 – 1906). His depictions were of simple subjects, but masterful in their execution, as exemplified by his works now in the Uffizi Gallery, Boy Playing Cards and, Girl with Racket and Shuttlecock. His training was under French history painters, Pierre Jacques Cazes and Noël-Nicolas Coypel (1690 – 1734), though he trained mostly from his own studies. According to the Getty Museum Biography on Chardin the painter got his start executing signposts for tradesmen and detailing the works of other artists. He was documented in 1724 as a member of the Academy of Saint Luc in Paris, but was discovered by Nicolas de Largillière (1656 – 1746), a portrait painter. 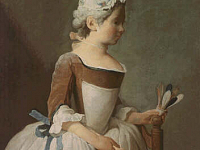 Largillière recommended Chardin’s entry into the Royal Academy of Painting (Académie Royale de Peinture et de Sculpture) in 1728. The works that garnered his acceptance into the Academy were, La Raie (The Ray) and, The Buffet, displaying his realistic representations and established his nickname as the “painter of animals and fruit.” From here Chardin developed his skill of still-life further and grew a love of painting genre works. The painter’s reputation escalated him into gainful patronage, including a pension from King Louis XV (1710 – 1774). His works continually evolved from simple still-life painting into highly detailed representations of everyday life in French society.